Liberty Midlands Mall is Your Shopping World in One. In grand splendor, the ‘Shopping World in One’ mall echoes the Kingdom of the Zulu, boasting an African design by indigenous culture, and is by far the largest centre in or near KwaZulu Natal Midlands. The centre has surpassed all expectations through the participation of first class tenants, fully committed municipality and province thus offering convenient shopping for the community. Shoppers can choose from nearly 180 shops including Game, Pick 'n Pay, Woolworths, Edgars and Cine Centre Cinemas. 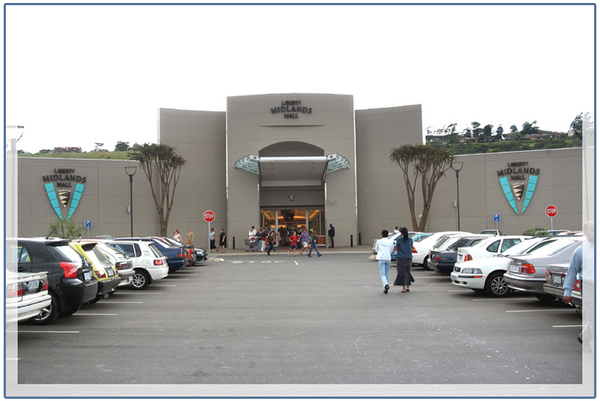 Conveniently located just off the N3 highway in Pietermaritzburg (take Armatage / Sanctuary Road off ramp), Liberty Midlands Mall promises a great shopping experience for both residents in the Kwa-Zulu Natal Midlands as well as travellers passing through. A R135million extension opened in September 2006 adding 36 new stores and is anchored by a 4500 square metre Edgars outlet. A new piazza-styled food court hosts four new restaurants and reflects Pietermaritzburg's Mediterranean climate. Over 3000 open and undercover parking bays ensure hassle free parking. For your convenience all shops are located on one level.